The undercurrent of dreading the inevitable percolates beneath our heavy layer of cheap perfume. We fear becoming sick then losing our jobs or the other way around. It doesn’t matter because if one happens so will the other. Then, we’ll also lose healthcare. We fear so much that we accept too much. I look at other mothers and fathers, men and women, and we nod, we smile, a resigned not yet angry smile. Occupy Wall Street hit an impressive nerve. Secretly, in those quiet corners after work ended, we smirked, vindicated for our silent sufferings. But now, when I look back at Occupy Wall Street, I look back even further. 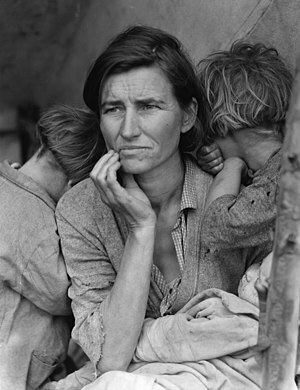 The Great Depression plunged Americans into a surprise hell where a response left them mute then violent. Today you can view the violent protests on YouTube. My great grandfather, whom I had the pleasure of knowing for a whole two years before his death, owned a bakery in Chicago, Illinois. He hired as many people as he could invent jobs but still couldn’t help the majority of the people who’d been abandoned by their employers. He fed people free bread on a daily basis. He made sure he sent word to anyone he knew that there was a good man or woman ready to work. He did all this with a push and a shove from my great grandmother who never let anybody she met go hungry. Even so, they couldn’t help everyone. In fact, the amount of people they could help was simply too small. The circumstances had cut too deep, the wound unable to heal. So the masses had to speak up. Like the Occupiers, they mustered the strength and anger to do something, anything about their situation. Whether born from desperation or frustration, it really didn’t matter because that’s more than many people could or would do. 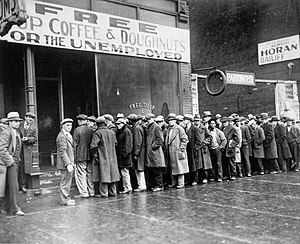 My great grandfather watched his all-American, capitalist ideals drop from the tears in his eyes as he handed men and women their dignity in the form of bread. In the 1920s, there were those who misspent their money on extravagant delights. It was a time of overindulgence and rebellion that set Americans up for failure. Protests are cries for help, shouts of the guttural kind, when people just can’t stay quiet any longer. Riots happen when no one listens. Right now, many of us still have our stuff. But, we’re struggling—our eyes show it. We, the workers, we’re tired. Then what? Do we dig a hole for them and say, “Jump in,” pushing them if they won’t go, covering them in dirt, suffocating them? Or, do we offer them a hand, a piece of bread in the form of dignity. Great post!! Your great grandfather sounded like an amazing man! So many factors here regarding the “why”, but first we need to start with ourselves.. I like your Grandfather.. I like this post even more as it brings awareness.. Yes, that’s why. Hopefully people who do read it will think about that, just being more thoughtful. He was a Republican and very much a businessman, but politics too a back seat for him during the Great Depression. I really enjoyed this post. It made me think of my grandparents. Your article gives true insight to the problem, well written, keep posting! Hi Lisa your great grandparents must inspire you every day. This was well written and you give a voice to our very real situation. Thank you very much. Coming from a very good writer, that means a lot. They do inspire me. I miss them so much. Hoping bit by bit they’ll inspire you all too. Your Great Grand Father sounds like a Giant of a man. There are more of these people than we sometimes remember. They stand hard and fast against the defeatests who say you can do nothing. What he did was, in the context of a huge national dissaster, a small thing; but massive in the lives of those he touched. Very well written too bad more people are not like your great grandparents,I really enjoyed this one.